THE Z125 PRO is a proper motorcycle, in miniature. It even looks like a Z1000, or at least there’s a family strong family resemblance, and while it doesn’t offer the performance of an open-class bike, it sure provides lots of low-risk fun. Kawasaki Z125 PRO test from Adrenalin Images on Vimeo. There’s no liquid-cooled four-cylinder powerplant there, just a modified KLX110 power plant – the capacity is up a bit and unlike its trailbike parentage, fuel-injected. No, we didn’t expect an air-cooled, two-valve, small capacity single to be this much fun, either. But at $4099, expecting more is a bit silly – the Z125 PRO offers more bang-for-buck than any other road bike we can think of on the market. What is cool are the upside down forks, single shock and steering geometry designed to make the Z125 PRO incredibly nimble – quick steering, easy to flick around and great at low speeds – but because the seat is low and the bike so compact, it really doesn’t feel slow. But high speed stability isn’t required of the Z125, flickability is, and its got that in spades, made easy to access by the relatively high, wide handlebars. At first glance you might think the ’bars are simply motocross-style, but look closely and you’ll see there’s a huge rise on them, which is so the bike fits adults. Realistically, you’ve got to think a little out of the box to get a short machine with 12-inch wheels to fit a grown-up, even if the primary target market are those with maybe still a little growing to do – teenagers. The seat height is tall considering the size of the wheels, but even if it’s higher than you’d really like the weight – just 102kg, ready to go – of the machine means it is not at all intimidating, and means the seat-footpeg-handlebar relationship actually makes sense to people over five feet tall. At six foot I’m a bit tall for the Z125 PRO, but my 15-year old son, a bit shorter but importantly lighter in both build and weight – wanted one. It’s a real shame in this country there’s no way he can be licensed for something like this until he’s near enough to 17, but that’s one of the prices we pay for living in a Nanny State. Yes, if you’re tall you’ll struggle with the ’bars banging into your knees while doing U-turns. If that’s the case the Z125 is too small for you, but in general I think Kawasaki has done a good job of making the Z125 fit as wide a range of people as possible. 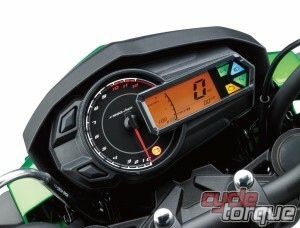 But yes, you could fit taller handlebars if you are tall and still want a Z125 PRO. 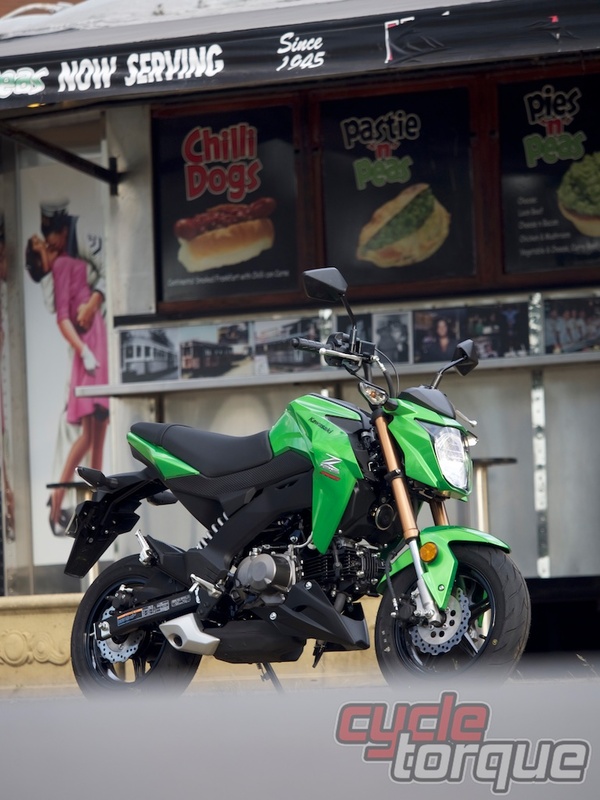 The 12-inch wheels are cast alloy units finished in stealthy black and fitted with tyres which look fat on such a small bike, which contrast well with the bright green of the paint and alloy underslung exhaust. There’s a box-section swingarm and engine cowl all finishing off the lower edge of the machine. Low-risk fun: The Z125 PRO. The dirt bike heritage of the machine means there’s already accessory parts and kits available to increase the performance of the Z125 if that’s your passion, too. In tighter neighbourhoods filtering is easy, parking simple and manoeuvring the bike when it’s not running ridiculously easy. It’s the perfect bike for those who wouldn’t ride a scooter if you paid them but do like the idea of a light, small, fun machine which will fit in the lift to your office. In a better world we’d be riding these things to work on weekdays and racing them on go-kart tracks on weekends. Many small, inexpensive bikes can disappoint when you look at the details, but not the Z125 PRO. There’s modern instrumentation, complete with a gear indicator, petal discs which offer good stopping performance without being intimidating, a decent range from the small tank but low fuel consumption and the sort of paint we’ve come to expect from Kawasaki. The tank holds 7.4 litres and we tested the bike for a week and never need to put fuel in the machine. The fuel consumption is somewhere between ‘not much’ and ‘who cares’. If the whole world was like Australia, the Z125 PRO wouldn’t exist – we like our bikes full-size, under the delusion we’re going to take on the outback at any given moment. The reality is different, with cities becoming more and more cramped and overcrowded parking areas, tiny garages and low speeds the norm, a Z125 PRO starts to make a lot of sense. Which is weird in a way, because we loved it around the office because it doesn’t make any sense – it’s too small for the roads and freeways we have at our doorstep up here in the Hunter Valley. But you don’t buy a Z125 because it makes sense – if that was the equation, you’d buy a scooter. 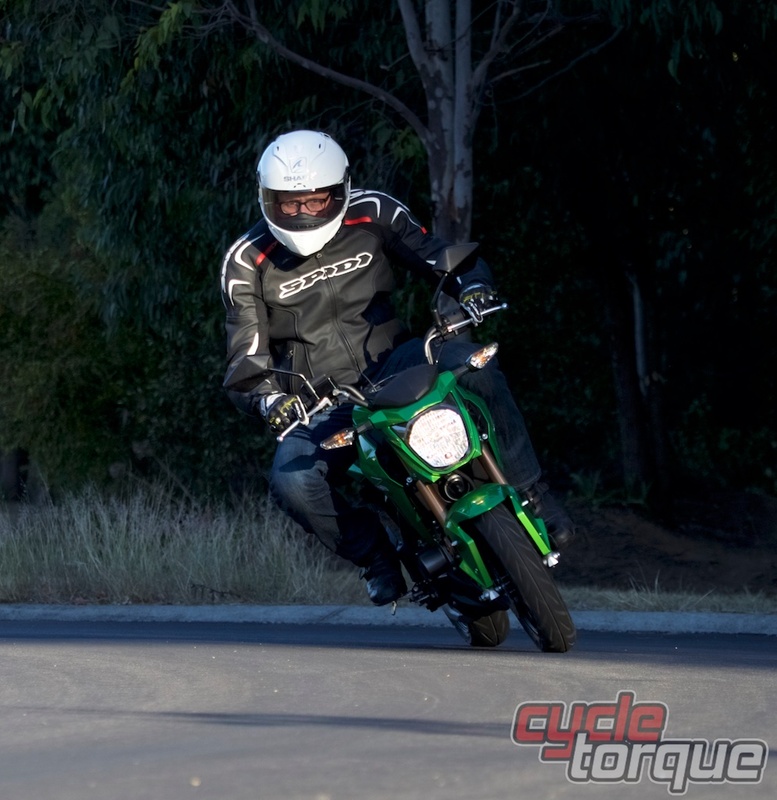 Nope, buy a Z125 Pro because it’s the most fun you’ll have with four grand and 125cc ever. This is the companion video we made for the test of the 2014 Kawasaki KX85. Read the test in the April 2014 edition.